If you’ve read any of my previous articles on white noise, you may think that I believe it can cure all ailments. But if you did some research after reading my articles, you may have run across other colors of noise. Today, I’m going to do a deep dive on three of the most famous ones. So let’s talk about white noise, pink noise, and brown noise. First of all, I should clarify one thing. All three noises play the same frequencies, ranging from 20–20,000 Hertz. However, if you listen to these various sounds, you’ll hear how much they differ from each other. Many people have their favorite — my favorites even depend on what I’m doing. After all, I’ve said that white noise can help improve productivity as well as promote relaxation. Obviously, those two properties sound contradictory when you see them laid out like that. At first, even I was confused. However, when you take into account that most people think of pink and brown noise as white noise, it’s clear to see how it can have so many different uses. But I’ll explain the various things you could use all of these noises for later on. First, let’s lay out some history and define what each of these noise hues is. Using colors to describe sounds may sound a bit odd at first but it makes sense if you stop and think about it. Colors usually describe light, right? Well, both light and sound travel in waves. We also measure both in Hertz or wave vibrations per second. However, as I previously mentioned in my article on the mediums sound can travel through, these types of waves typically have different modes of transportation. While sound needs a medium to pass through — and therefore cannot exist in a vacuum — light doesn’t require a medium. That’s because light waves are electromagnetic, rather than mechanical. Colors are merely useful for describing the quality of the sound or light waves as we perceive them. So white light will look a certain way to our eyes and white noise will sound a certain way. Other than the three colors of noise I’m going to discuss in detail, there are several other colors that can be used to describe a sound. 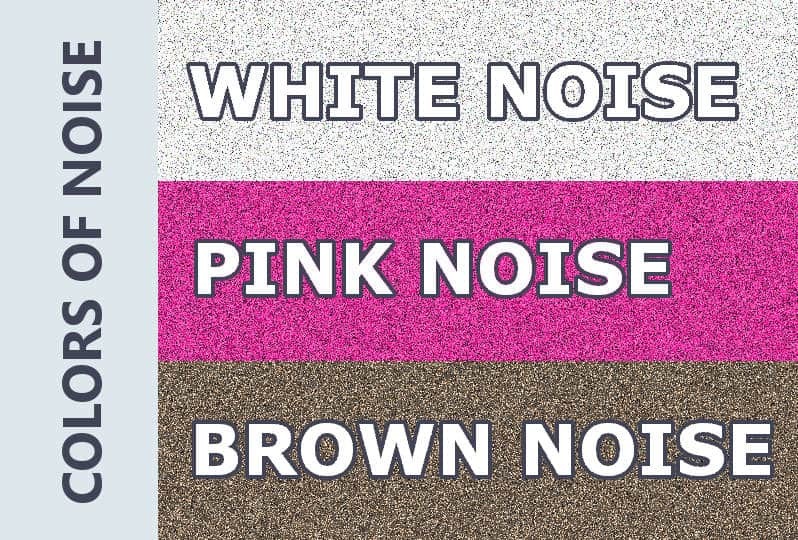 I’ll briefly explain those after I go through the definitions of white, pink, and brown noise. As you can see, you don’t have to be a synesthete to be able to recognize the various colors of noise. So then, how can you know what color the noise you’re listening to is? Let’s start with white noise. As I’ve mentioned many times before, white noise is an amalgamation of all humanly perceptible frequencies. So it’s just like white light, which is a mix of all colors. But then, as I have previously mentioned, pink and brown noises also feature all of these frequencies. So what makes white noise different? Well, essentially, white noise consists of all of these frequencies as we hear them. As you can imagine, our ears can be deceiving. In this case, it’s because we hear higher frequencies louder so they’re more noticeable. The result is a mostly high-pitched hissing sound that could either be relaxing or hype you up. Those of us who grew up before the age of flat screen and stable TV signals tend to have an adverse reaction to white noise. After all, hearing static used to mean that we won’t be able to catch our favorite shows when they’re airing. But just because we’ve been conditioned to think of this noise as something bad, it doesn’t mean that it actually is. Although the sound could be mistaken for rain, it has that omnipresent high-pitched crackling noise throughout. That’s why many people don’t find this noise to be relaxing. So now let’s see two types of noises that may be more pleasant to listen to (in my opinion, at least). In articles prior to this one, I explained that 80 decibels are actually twice as loud than 70 decibels. The same goes for frequencies, they get progressively louder — which is why we hear the higher frequencies in white noise more prominently. But if you listen to pink noise (video below that is curiously provided by the same YouTube channel as the white noise link above), you won’t hear those high frequencies. As I have mentioned, pink noise contains exactly the same frequencies as white noise. However, the higher end of the frequency spectrum is modified so all octaves carry equal amounts of energy. In comparison to the white noise frequency profile, pink noise decreases the power density by 3 decibels with every rising octave. So it makes the higher frequencies less powerful, allowing them to blend more seamlessly into the other the sounds. For the purposes of using pink noise to work or sleep, people usually go in and manually equalize the sound of static to get pink noise. But this color of sound can also be found in nature. In fact, you’re likely to hear pink noise in the incoming sea or river tides, heartbeats, electronic devices, and some stellar light emissions. Even single neurons firing sound like pink noise. Because it is essentially everywhere, many scientific fields are looking into this noise. Naturally, I’m most interested in the psychological side of it, which I’ll discuss later in this article. For now, I’ll just note that biologists have confirmed that pink noise has an effect on brain activity. There has been prior research stating that white noise is capable of achieving similar results. Still, I do prefer pink noise for its more balanced range. But now, let’s talk about the deepest noise of these three: brown noise. Brown or red noise is the lowest color of noise, so it may be the most comfortable sound for sleep. Actually, unlike the previous two color noises, this one wasn’t named after a color at all, but Robert Brown, a Scottish botanist. If you still want to use the comparison to color frequencies, you can just call it “red noise” instead. Since the color pink is less intense than red, you can probably imagine what red noise sounds like. Brown noise is even deeper than pink noise, resembling the sound of a waterfall in the distance or heavy rainfall. Rather than decrease the power density by 3 decibels per octave, you get a 6-decibel decrease, making the highest end of the spectrum almost entirely silent. In my opinion, that makes this type of noise perfect for relaxation. Now, Brownian noise isn’t the same thing as the brown note, a deep vibrating tone that supposedly got its name because it has the ability to make people lose control of their bowels. Obviously, that’s not true. In fact, if that were the case, everyone would be soiling their pants in every movie theater. The brown note is that deep booming sound they put into movie trailers to make them sound more dramatic. And they sure do! But Brown noise will never make you feel the same kind of anticipation. Still, I felt the need to make the distinction. Apparently, so did the person behind the YouTube channel I’ve been linking to give you all of these noise previews. The Brown noise video title makes it clear that the audio doesn’t contain the brown note. GRAY noise makes the lower end of the frequency spectrum more powerful than the middle and the higher end, but it also allows the higher frequencies to maintain some of their power. The result is a fairly pleasant, even noise-resembling, rumbling of a thunderstorm in the distance. BLUE noise, on the other hand, purposely allows the higher end of the spectrum to overwhelm the other frequencies. So it’s more similar to white noise than red or pink noises. In fact, it’s the opposite of pink noise, as it increases the power density by 3 decibels per octave. Basically, it sounds like high-pitched hissing and feels much more energizing and potentially irritating than the lower frequencies. VIOLET or PURPLE noise is a bit difficult to describe, as you’d know if you heard it. It completely ditches the lower end of the sound spectrum and is only slightly higher in pitch than blue noise. Additionally, it’s also much denser, increasing the power density by 6 decibels per octave rather than 3 decibels. If you’ve caught on to these trends, you should also be able to guess what black noise is as well. So if white color is the presence of all colors at the same time, then black color is the absence of colors. So black noise is actually silence — and yet the YouTube channel I pulled the samples from even has a 10-hour black noise video! It’s literally an empty black screen with no sound and it has 5 and a half thousand views, which I found particularly amusing. Earlier, I promised to let you know what all of these colors of noise should be used for. Never let it be said that I don’t deliver. The truth is that you can actually use these noises as you please. So I urge you to look all of them up and figure out which ones you prefer. Who knows, you might realize that you find one of other colors of sound more pleasant than white, pink, or Brown noise. Now, if you’re more of a visual and auditory learner, you can also check out this SciShow video explaining the concept of noise colors. Personally, I’d avoid using the higher pitched noises like the purple, blue, and white noise for relaxation. But then, that may just be me. I just know that the high sound frequencies tend to be annoying more often than not. If you happen to get a white noise machine, though, you could use it at a low volume. Whether you’d like to be more efficient at work or fall asleep to the sound of white noise, a low-level buzz will be enough to get you in the right mindset. On the other hand, the deep noises such as pink and red (or Brown) noise are pretty much a safe bet when it comes to falling asleep. You can use them yourself or to put your baby to sleep. In my opinion, they’re simply more pleasant to listen to whether you’re working or relaxing. Ultimately, though, all of these noises are efficient at masking other sounds. So when it comes to what you’re going to listen to and for what purpose, everyone would need to come to the type of noise that’s best for them on their own.